Losing teeth can be a distressing experience and many people become self-conscious about smiling when one or more teeth are lost. Missing teeth can cause problems with biting and chewing food and adjacent teeth may become misaligned as they move into the gaps. The remaining teeth also have to withstand an increased load when you bite and this may lead to a reduced lifespan of existing fillings, crowns and bridges. Once we have carried out a thorough assessment, we will discuss the options available to you for the replacement of missing teeth. This will allow you to make an informed decision on the best treatment option for you. 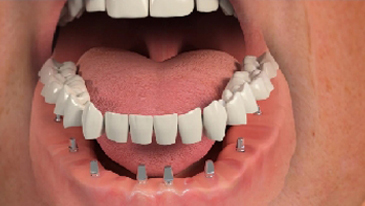 Dental implants can be used in cases where patients have one or several teeth missing. If this is your preferred treatment option, we will refer you to a hand picked experienced specialist team, who will be able to provide you with treatment of the highest calibre.